Half Moon Bay Golf Club welcomes social golfers whether you play once a month or once a year. Simply pick up your free Frequent Players Card next time you check-in and start playing more golf! Includes 2 FREE motorised carts! 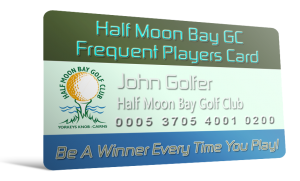 It get’s even better though… as soon as your card is full, drop it into the Golf Shop to go into the major prize draw for a Full Annual Membership of Half Moon Bay Golf Club! Be A Winner Every Single Time You Play! Cards must be stamped by the Proshop prior to each game. Only full green fee rounds qualify for a stamp. Other discounts and promotions cannot be used to earn rewards. Bonus games are valid every day outside normal competition times, subject to availability. The Frequent Player’s program is for non-member and visitor social rounds only. Cards, rewards and prizes are NOT transferable.